Little Rock - The Little Rock Central High School Desegregation 50th Anniversary Commemorative Silver Dollar will be available tomorrow, May 19th, at the coinâ€™s first day of issue ceremony. 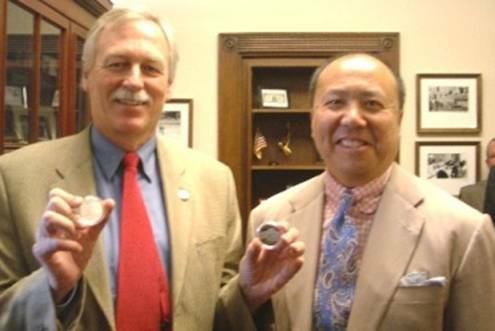 The Central High Commemorative Coin was minted as a result of the bill introduced in 2005 by Congressman Vic Snyder instructing the Secretary of the Treasury to mint 500,000 silver dollar coins in commemoration of the 50th anniversary of the desegregation of the Little Rock Central High School. The heads side (obverse) of the coin depicts the feet of students escorted by a soldier and walking toward school below a row of nine stars symbolizing the Little Rock Nine. The tails side (reverse) depicts Little Rock Central High School, circa 1957. Pictures and more information are available at the U.S. Mint web site. Proof coins will be available for purchase tomorrow at the first day of issue ceremony for $39. They will continue to be available at the Central High Visitor Center while they last. For the first 30 days of availability, the proof coins will be available directly from the U.S. Mint for $35, and the uncirculated silver dollar coin $33 (plus $4.50 shipping). Thereafter, the regular price will be $39 for the proof, and $35 for the uncirculated coins (plus shipping). Orders may be made at www.usmint.gov, or by calling 1-800-USA-MINT (872-6468). Hearing and speech-impaired customers may order by calling 1-888-321-MINT (6468). In 1957, Little Rock Central High School was the site of the first major national test for the implementation of the U.S. Supreme Courtâ€™s Brown v. Board of Education of Topeka decision and became the international symbol of the end of racially segregated public schools. The desegregation of Central High by nine African American students was influential to the Civil Rights Movement, and recognized by Dr. Martin Luther King, Jr. as such a significant event that in May 1958 he attended the graduation of the first African American from Little Rock Central High. Moreover, it changed American history by providing an example on which to build greater equality, and ultimately a better America. Proceeds from a $10 surcharge on each commemorative coin will benefit educational programs and capital improvements at the Little Rock Central High National Historic Site. If all of the authorized 500,000 coins are sold, the proceeds would total $5 million, but the anticipated number of coins that will be sold is indeterminable.